Brussels’ Centre for Contemporary Non-Objective Art [CCNOA] in collaboration with RPProjects proudly present 2 step—an exhibition of video and sound art, by abstract artists who primarily work in other media, such as painting, sculpture, and installation. As artists often explore other artistic media as part of the body of their work, this exhibition frames these explorations—a “two-step” into another medium—highlighting visually challenging works related to the individual artist’s practice. Consisting of over 40 video and sound artworks, artists for the exhibition come from Australia, Austria, Belgium, Canada, Germany, Iceland, the Netherlands, Luxembourg, Norway, UK, and USA. 2 step artists include Jacqueline Pennell (UK), who primarily works with installation and photography. Pennell will be exhibiting her video Out of Square (1998) in which fleeting shadows pass across a small, isolated floor area of a public square. The shadows themselves were created by people, which have been extracted from the video. For Pennell, Square is about “extracting something in order to reveal more of what is already there”. From Germany, Gerold Miller, who will have a large-scale show of his abstract 2D-3D works at Berlin’s Hamburger Bahnhof in September, will be exhibiting an untitled screen saver (2000). The red-and-white flash-motif composition relates to Miller’s practice of placing this composition across media, such as on a permanent, large-scale installation above a department store [in Singen, southern Germany] and on tile covering a public restroom [in Mainz]. The sounds of a pinball machine accompany the piece which fuses the aural flashes with the visual ones. Meanwhile, John Beech (USA) will exhibit Dumpster (2000), a film of images of various garbage containers in New York City made in collaboration with filmmaker Einar Westerlund. Primarily a sculptor, this film serves in part as an archive of source material for Beech, who positions the dumpster as a central theme in his sculpture, due to its inherent convergence of utility and reductive form. Also contributing to 2 step, Mark Pimlott’s (CAN/UK) Hole video (2002) “contemplates the navel of America” with close-ups of Niagara Falls, and “deals with the fantasy of the end that resides deep in the American psyche”, acutely felt by Pimlott. In addition to being a practicing artist involved in gallery exhibitions and public art projects, Pimlott was also one of two design coordinators for the Philippe Starck-designed, Ian Schrager Hotels in London. In the CCNOA project room, four DVD projections will be exhibited including Margaret Dreher (DL) and Dan Walsh’s (USA) explorations in colour, and Jennifer Bolande’s (USA) video (1999) of a sculpture she created fusing a New York modern architecture landmark, Lever House, and an appliance store. 2 step’s exhibition design, by Tilman (DL/BE) and Djos Janssens (BE), consists of an abstraction of the light waves which produce video and sound art/technology itself. This results in an “installation” comprised of the walls and ceilings painted in complementary colours— yellow, blue, and red— which refers to these artists’ practices exploring colour, light, and volume. 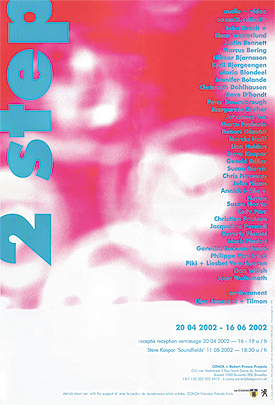 Other exhibiting 2 Step artists include: Marcus Bering (DL); Hilmar Bjarnason (ICE), Kjell Bjorgeengen (NOR); Maria Blondeel (BE); Christoph Dahlhausen (DL); Lieve D’hondt (BE); Peter Downsbrough (USA/BE); Johannes Fox (DL); Marco Fusinato (AUS); Robert Glaubit (USA); Marcia Hafif (USA); Lisa Holden (UK/NL); Steve Kaspar (LUX); Susan Morris (UK); Chris Newman (USA); John Nixon (AUS); Annick Nolle (DL/BE), Susan Norrie (AUS); Kelly Parr (USA); Christian Paulsen (DL); Beverly Piersol (USA/AUSTRIA); Gerwald Rockenschaub (AUSTRIA); Philippe Van Snick (BE); Piki Verschueren (BE); and Joan Waltemath (USA). Since its inception in 1998, CCNOA, a multidisciplinary non-profit exhibition space in Brussels, has organized more then 30 solo and group exhibitions with abstract artists from around the globe, including John Nixon, Shinichi Yanai, Beat Zoderer, Dan Walsh, Simon Ungers, Ingo Meller, Gerold Miller, Marthe Wéry, etc. Located in central Brussels, this 200 square meters “white cube” exhibition space [c. 2002] is the brainchild of German-turned-New Yorker Petra Bungert, former Head of Administration at New York’s P.S. 1 Contemporary Art Center and Director of New York-based Petra Bungert Projects [PBP] (1995-97). Previously, RPProjects has collaborated with spaces and co/curated/organised exhibitions in Hong Kong (1997) (Female Positions: Yoshiko Shimada at John Batten Gallery); Bangkok (1999) (Desire: Susan Morris at Project 304); and Rotterdam (2000) (UNLEASHED: Lisa Holden at Ron Mandos galerie). In April/June/August 2002, RPProjects will present A Triptych across Time: Artists respond to Bosch’s ‘Garden of Earthly Delights’, three separate installations at Rotterdam’s Museum van Nagsael, the world’s smallest museum.